One aspect I admire in the traditional Native American culture was their ability to work with nature, not rushing the seasons but making good use of the bounties of each one. 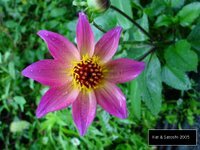 Succotash is an example of this wholeness with nature. Invented by the Native Americans themselves, this dish consisted mainly of lima beans and corn, two crops that grew abundantly, each with unique characteristics. Lima beans are full of protein while corn packed a high concentration of starch. Combined, they made a wholesome, nutritious meal which supplemented daily activities. Succotash has survived history while being transformed into a dish that spans more than just a combination of lima beans and corn. In the southern United States, a mixture of vegetables and lima beans are combined with butter. In some parts of the midwest, green beans and lima beans are combined. In other places, kidney beans are substituted for lima beans. 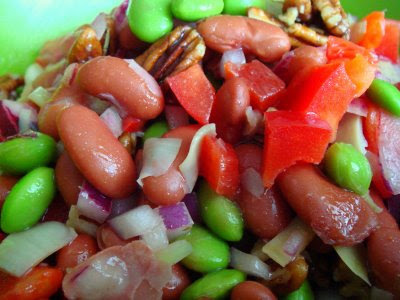 In a small kitchen in Minneapolis, edamame and lima beans are mixed with red peppers, red onion and rosemary pecans, and tossed in a tangy key lime dressing. Combine all ingredients and toss well. Chill before serving. 1. Whisk together lime juice and sugar until sugar disolves. 2. Add pepper flakes and grape seed oil until a slight emulsion forms. Whisk in red wine and season with salt and pepper. 1. In a sauce pan over medium heat. add honey, rosemary and chili powder. Cook for two minutes until honey has liquified. 2. Remove pan from heat and toss pecans thoroughly until well coated. Season with salt and pepper. 3. Spread out on a baking sheet and allow to cool. sounds so refreshing and perfect for a picnic! 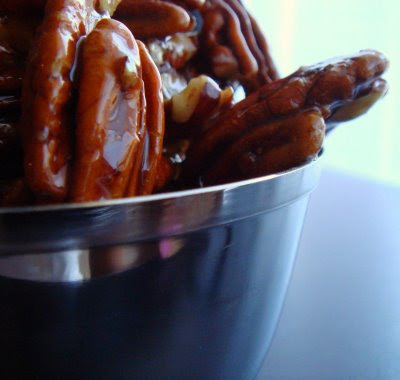 I love sweet and herby pecans. This looks like a great dish!